Growth indices are often highly skewed towards technology stocks. Information technology currently has a weight of 23%[i]in the MSCI World Growth Index (in Europe the growth index is more evenly split across sectors). It is no surprise that the growth style has performed particularly well when investors have been excited by the potential returns from rapid technological innovation, such as during the 1990s tech boom. By contrast, the MSCI growth index underperformed through the stock market expansion of the 2000s, which was focused on housing, finance and commodities rather than technological innovation. Given the advanced nature of the cycle, and the relative pricing of the two styles, investors may wish to consider adding a carefully selected group of value stocks to a portfolio. 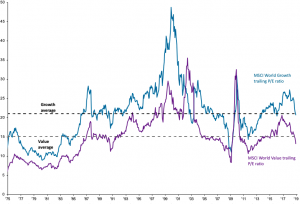 Historically, at least, value has tended to perform better in the initial recovery phases after a bear market[i]. 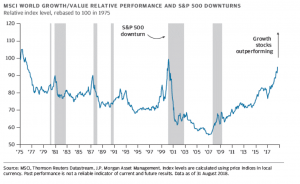 In previous downturns, and indeed during the correction in the fourth quarter of 2018, value stocks fell less than the overall market and outperformed growth stocks. The exception to this rule was the financial crisis, but a repeat of a financials-led downturn seems unlikely given banks are now more highly capitalised and have less leverage than 10 years ago. [i] Technology weighting in the MSCI World Growth Index was 30% in October 2018, which was prior to the reclassification of some Technology stocks into the Communication Services sector. Communication Services now makes up 10% of the index. [ii] How should we prepare portfolios for the next downturn?, Michael Bell, J.P. Morgan Asset Management, October 2018. The Market Insights program provides comprehensive data and commentary on global markets without reference to products. Designed as a tool to help clients understand the markets and support investment decision-making, the program explores the implications of current economic data and changing market conditions. 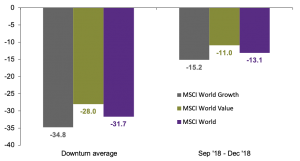 For the purposes of MiFID II, the JPM Market Insights and Portfolio Insights programs are marketing communications and are not in scope for any MiFID II / MiFIR requirements specifically related to investment research. Furthermore, the J.P. Morgan Asset Management Market Insights and Portfolio Insights programs, as nonindependent research, have not been prepared in accordance with legal requirements designed to promote the independence of investment research, nor are they subject to any prohibition on dealing ahead of the dissemination of investment research.